Home » Blog » Property Division in Texas Divorce Needs to be Equitable, but not Equal. A Plano Divorce Attorney Explains the Difference. 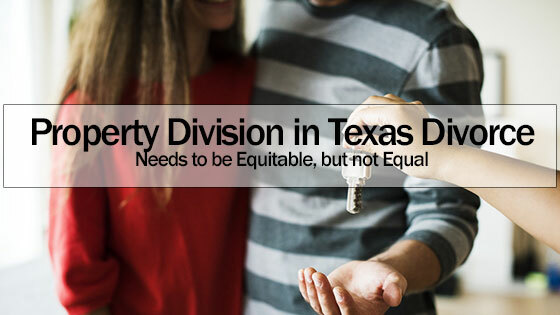 Property Division in Texas Divorce Needs to be Equitable, but not Equal. A Plano Divorce Attorney Explains the Difference. Marriages are legal institutions that join two individuals into one legal entity that shares property, lien, debt, liability and lives together. Marriages typically dissolve all the property acquired by individuals during marriage into community property. Federal and state laws often allow individuals to retain the property that they held before marriage as separate property. Separate property, by law, belongs to individuals and their spouses cannot legally claim such during divorce proceedings. Apart from property and assets acquired before marriage, gifts and inheritance given to married individuals constitute an individual’s private property and are never up for division during divorce proceedings. However, all the community property of a married couple is always subject to legal division by divorce courts where it fails to agree on division amicably. If you are considering divorce it is imperative that you talk to a Plano divorce attorney to get a full understanding of the legal process ahead of you. Only a few states in the country divide community property in divorce cases by splitting assets of a couple into half value. The process of equal distribution may sometimes involve liquidation of properties in case hard assets make the equal distribution of assets difficult. The states include Nevada, Arizona, Idaho, California, Washington New, Mexico, Louisiana, Texas and Wisconsin. Normally, the spouses each walk away with fifty percent of a couple’s total community property after an evaluation. The state of Texas has laws that require its divorce courts to split marital property in a fair and just manner to protect the institution. Marriage, as a legal institution, is often misused by people to gain financial and social favors. The court is always directed to use its wisdom and discretion to gauge the reasons behind divorce cases and distribute the communal properties of differing couples equitably. Seldom does any equitable distribution of property surmount to an equal distribution of property marital property during marriage dissolutions. This is because married spouses contribute differently to their marriages. In fact, it is farfetched to reason that partners can contribute equally to a marriage. The nature and magnitude of the community property. Parental custody and responsibility if applicable. Differences in spousal income and earning potential. Any need for future lifestyle support. Individual contributions to the union and sacrifices made from the beginning of the marriage. Future business opportunities created during the marriage. Incumbent financial obligations and liability. Viable prenuptial agreements entered before marriage. In case you might be going through a marital separation in Texas or any other state, you need to find a reputable, skilled, passionate and aggressive divorce attorney to help you navigate through all the above factors. Experience is a key factor in determining how your attorney can influence your partial allocation of the communal property from a value of five percent to even 99 percent. However, the nitty-gritty details of your case determine the outcome. Your attorney can only secure as much value for you as possible or let it all go to your spouse through inexperience, disinterest or poor counsel. On Appeal from the 246th District Court Harris County, Texas, Troy Lee Christensen lost the value of over a quarter of a million dollars after the appellate court held its subordinate’s ruling. Christina Christensen had sued him at the trial court for misusing marital property and fraudulently seceding over 60,000 dollars’ worth of property shares without her knowledge. Appellate cases must be won on the bases of law. Unfortunately, the appellate ruling faulted the appellant’s legal arguments for a lack of understanding on whose responsibility it was to provide evidence and on which grounds divorce appeals should be based.